Long cylindrical hot pepper, turning red at full maturity. Upright, vigorous plant, suitable for multi-stem cultivation. The long, dark green fruits are 2-3 cm wide, 17 cm long, with a very pungent taste. FUEGO F1 fruits can withstand export, due to their thick walls. 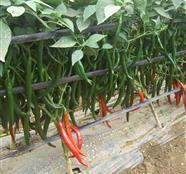 Under protected cultivation, this variety is characterized by its high yield and the continuous fruit set.